Lucía Sanromán is an independent curator and writer who lives between Mexico City and San Diego, CA. Her current focus lies in investigating aesthetics in relation to efficacy in public and social practice and exploring the relationships and limits between aesthetics and disciplines outside of the arts. From 2006 to 2011, Sanromán served as Associate Curator at the Museum of Contemporary Art San Diego. In 2008 she co-curated, with Ruth Estévez, the inaugural exhibition for Centro Cultural Tijuana’s expansion with the exhibition Proyecto Cívico/Civic Project. She was curator of Political Equator 3 organized by Teddy Cruz for UCSD/Ford Foundation (2011); Proyecto Coyote for Encuentro Internacional de Medellin 2011 (MDE11); and Anomalia for the University Art Gallery at UC San Diego (2012). She is the editor, with Cesar Garcia, of Marcos Ramírez ERRE published by INBA and Museo de Arte Carrillo Gil (2012), and was a lecturer in the contemporary art symposium SITAC: estar-los-unos-con-los-otros in 2013. Sanromán has been awarded the 2012 Warhol Foundation Curatorial Fellowship for Citizen Culture: Art and Architecture Shape Policy, an exhibition and research project organized by the Santa Monica Museum of Art for September 2014. She organized the retrospective exhibition inSite: Cuatro ensayos de lo público, sobre otro escenario, at Proyecto Siqueiros: La Tallera, in Cuernavaca Mexico in (March 2014). 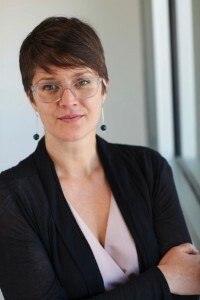 She is co-curator with Candice Hopkins, Janet Dees and Irene Hofmann the next edition of SITE Santa Fe’s signature Biennial SITElines.2014: Unsettled Landscapes (July 2014). She is an awardee of a The Pew Center for Arts & Heritage Fellowship for 2014. Sanromán is Estudio SITAC Director for 2014-2015.